If you would like the system to create Accounts Payable invoices to vendors when inventory purchase orders are received, you will need to set up a few things. Note that you should NOT use this feature if the actual amounts due vendors do not match the amounts on the purchase order; otherwise you will need to create additional A/P invoices and possibly create credit invoices. Your time will be better spent simply creating the A/P invoices based on invoices sent to you from the vendors rather than adding to or adjusting automatic invoices that may not be the amounts you actually owe. You must have Execu/Tech's Back Office system in order to use this feature. 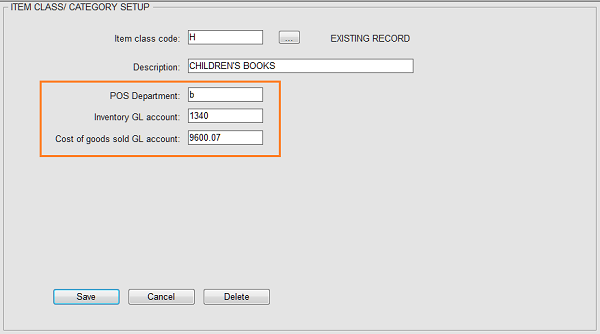 In the Inventory Store Record enter the earliest date you would like to accept GL transactions. 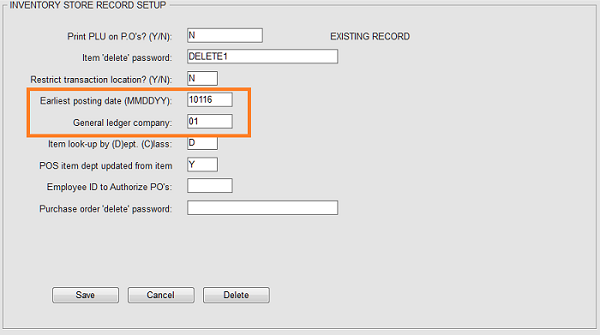 This should ideally match your GL control record's earliest posting date. Also enter the GL company. This is particularly important if you process accounting in one company (such as 01) and your inventory is in a different company/store (such as 04). In the Inventory Class/category setup enter the POS department, GL inventory account number and GL Cost of goods sold account number. Execu/Tech cannot advise you on the appropriate GL accounts to enter. You should consult your accountant or controller if you are not sure. When A/P invoices are posted, the invoices will credit the "A/P control account" as set up in your Accounts Payable control record and will debit the "Inventory GL account" that you enter here. Nothing will post to the "cost of goods sold GL account" but it is a required field, used elsewhere, so you should go ahead and enter that account number. In the Inventory Item setup you should enter a valid Vendor code. This vendor should be set up in A/P as this is the account to which the invoice will post. If the vendor has not been set up in advance, you can set it up on the fly. You can press Enter in the "Vendor code" field (if blank) to look up existing vendors. If you do not see the vendor, press Esc on your keyboard to set up the vendor. Vendor codes are set up in Accounts Payable - Accounts Payable Processing - Set up vendor master. The Vendor Code should be five or fewer characters, alphanumeric. The "vendor code" is the record key and cannot be changed once set up. 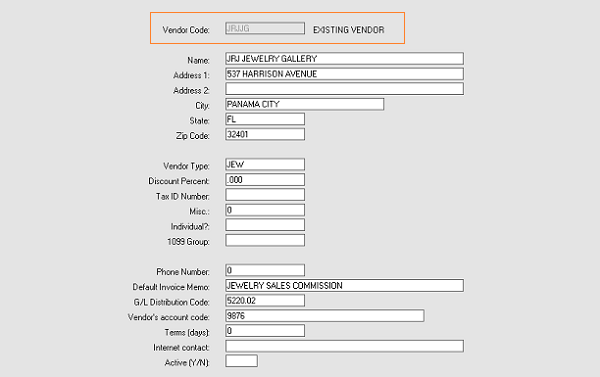 You may enter a vendor type if you wish to print reports or pay vendors by vendor type. 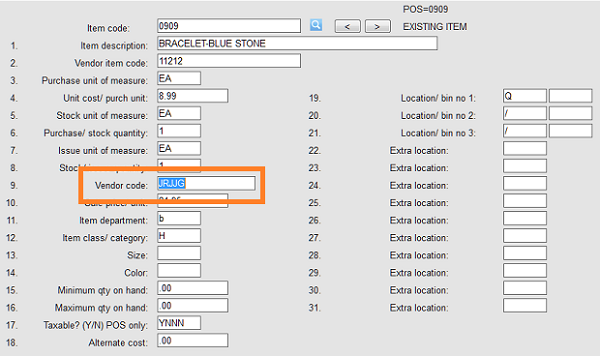 The vendor type field is three user-defined characters such as LIN for Linen. See the Back Office documentation for additional instructions. A/P invoices are created when the inventory batches are updated after purchase orders are received. The image below shows the receipt of an inventory item. NOTE: It is important to enter the "Due Date", "General Ledger Date" and "Invoice Date". These fields are required for A/P invoices. The inventory batch is updated. When the inventory batch was updated, the A/P invoice was created. See the Back Office documentation for Accounts Payable processing. See also Inventory - GL Integration .